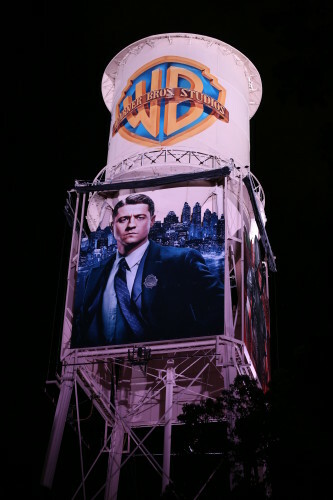 It stands looming 100 feet over the Warner Brothers Studio Lot, an iconic historical landmark. Though three animated creatures once dwelled inside it, the 100,000-gallon tank is currently empty. But this week, it has gotten a bit of a sprucing — a super sprucing. The Warner Brothers water tower will spend 90 days proudly sporting the logos and faces of some of television’s mightiest heroes — the only power that could celebrate CBS, the CW, and Fox all at once. 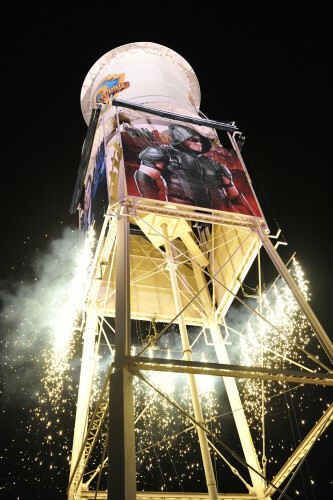 Dozens of studio artisans, engineers, and artists collaborated on this first-of-its-kind installation celebrating four Warner Bros. Television series based on characters from DC Comics. 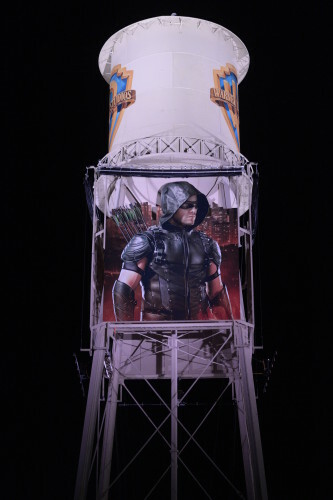 Giant aluminum panels bearing the likenesses of characters from Arrow, The Flash, Gotham, and Supergirl were hoisted up and placed on the tower for unveiling Monday night, October 19th. 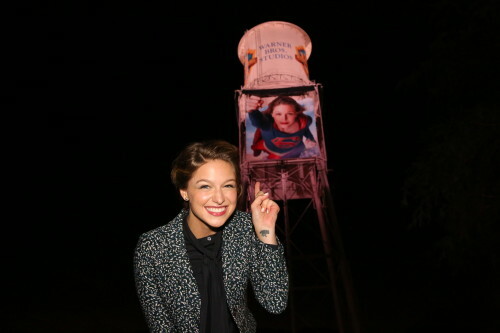 Creative talent from on and offscreen on these shows gathered for the unveiling ceremony, including Supergirl star Melissa Benoist, Gotham stars Erin Richards and Cory Michael Smith, and executive producers Greg Berlanti & Andrew Kreisberg (Arrow, The Flash, Supergirl), Ali Adler (Supergirl), Marc Guggenheim (Arrow), and Bruno Heller, Danny Cannon & John Stephens (Gotham). 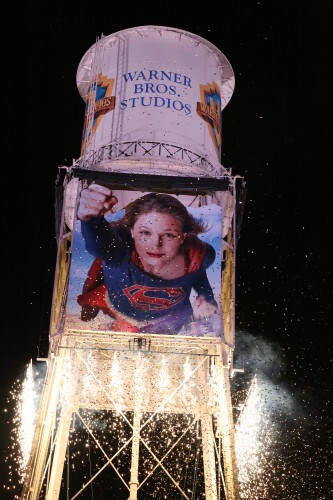 And seriously, it does say a lot about the popularity of these shows — and maybe the cultural impact of comics right now — that Warner Brothers would alter the symbol of their company, if only for 90 days. 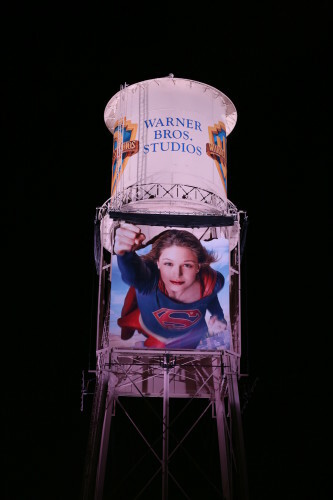 So if you happen to be driving in Burbank over the next three months, look up in the sky — though not too high. 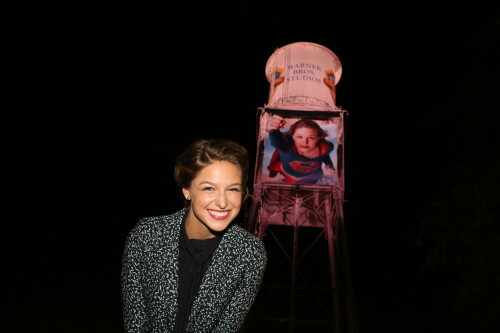 It’s a water tower, but it’s also a reminder of what most of us have known for years. Comics rule.